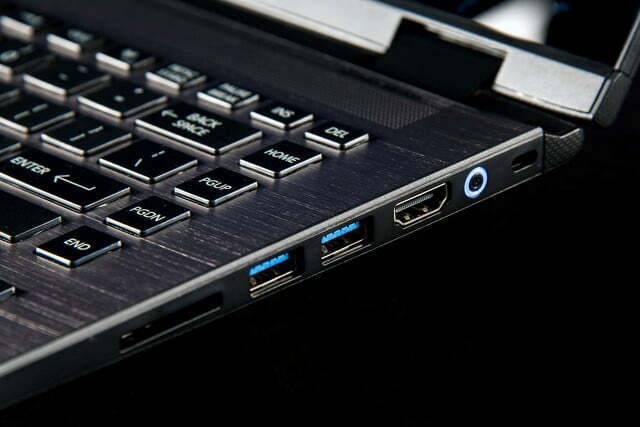 For what you pay for it, the Toshiba Radius 14 is hard to beat. Windows convertibles have a price problem. While the average price of a new notebook is $600, it’s difficult to find a 2-in-1 that sells for less than $800. Well, actually, they can be found – but usually just with an Intel Braswell based processor, such the Atom or entry-level Celeron lines (the recently reviewed Acer Switch 10 E is one example). These are much slower than the Core processors most people are familiar with, and for the most part aren’t what users want in a Windows PC. 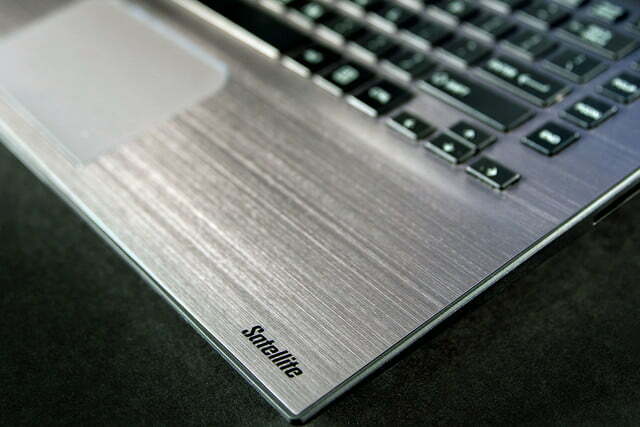 Enter Toshiba’s Satellite Radius 14. While far from the most lavishly equipped system we’ve reviewed, it did arrive at the Digital Trends office with an Intel Core i3-5015U processor, 6GB of RAM and a 500GB solid state drive. This hardware will set you back about $585 if you pay MSRP, but deals seem frequent and Best Buy will ship you this model for a surprisingly slim $500. That’s just a hundred bucks more than a typical entry-level, Atom-powered 2-in-1, and the same price as a bargain-minded mainstream notebook. 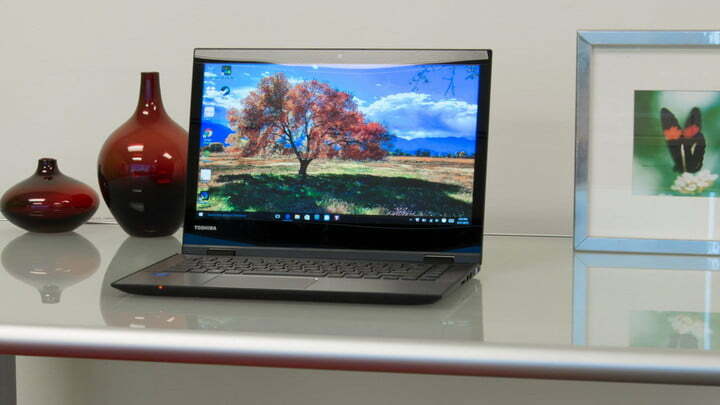 Unlike many competitors, this Toshiba doesn’t make you pay a multi-touch tax. But does that mean other areas have been sacrificed? The Radius 14 is a system built to a budget, and that’s evident in its design and construction. Most of the system is plastic. Effort has been made to class up the material – the display lid, for example, has a faux-metallic look – but this is successful only until the notebook is touched. Chassis flex is obvious whenever the Radius 14 is handled. Toshiba did spring for a real aluminum interior, however, something you’re not guaranteed to receive in a sub-$600 notebook, nevermind a 2-in-1. The hinges are solid metal, too. Such enhancements are appreciated at this price. Like so many other convertibles, the Radius 14 becomes a tablet by rotating the display backwards 360 degrees until it’s flush with the bottom off the system. This is the simplest, easiest way to make a 2-in-1, and appropriate given the price. The rotation is smooth throughout its range, but a bit too easy, as the screen has a tendency to leap back when the laptop is carried, or quickly placed on a desk. 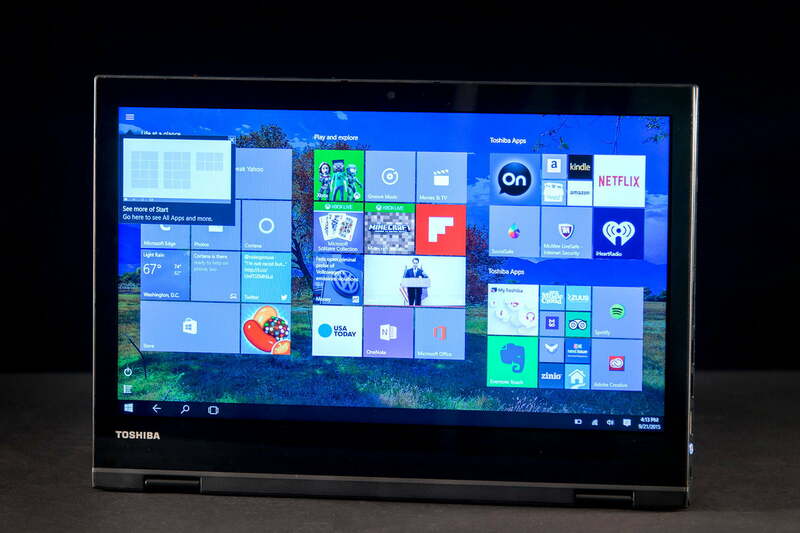 You’ll likely not use tablet mode frequently, though, because this Toshiba weighs in at a hefty 4.5 pounds. To be fair, it offers a slightly larger screen than most of its peers (a 10 to 13-inch display is more common), but there’s no getting around a simple fact; holding 4.5 pounds aloft for more than a few minutes is tiring. And you’ll be making a visit to your dentist if you accidentally drop the Radius while trying to watch YouTube in bed. Then again, I doubt anyone is going to cross-shop the Radius 14 with an iPad. This is a mid-sized laptop by modern standards, and it’s best for users who want occasional access to a tablet’s convenience, but don’t use it enough to justify buying a stand-alone slate. This isn’t a luxury 2-in-1 like the HP Spectre x360, and it feels well-engineered for its price. 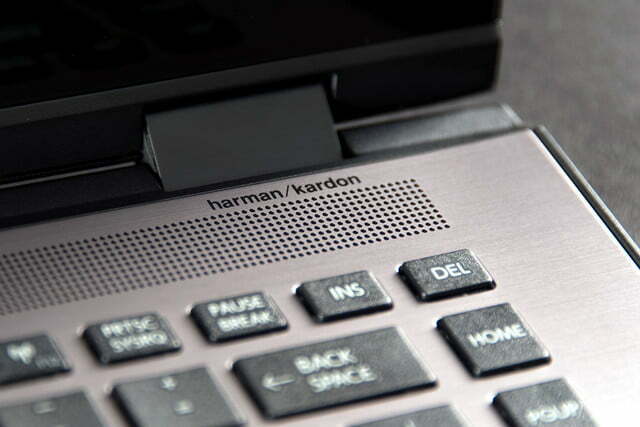 The Radius 14’s keyboard, like many produced by Toshiba, is a bit weird. It offers a fairly conventional layout, but the key caps aren’t as large as most notebooks, and are much wider than they are tall. Using the keyboard seems odd because a tap often grabs just the corner of an undersized key. Tactile feel is rubbery, as well. I didn’t notice a significant decrease in typing speed or accuracy as a result of these flaws, but the user experience needs work. Toshiba sprang for a real metal interior – and hinges, too. There is one key on the Radius that’s unusual, and that’s the so-called Cortana button. This name is in fact a bit deceiving, because it’s not branded with the Cortana logo, and it does not activate Cortana’s voice search by default. Instead it simply brings up the Cortana desktop search interface. Still, it’s a useful addition. Keyboard backlighting is not available. While that feature is now available in some sub-$600 systems, it still isn’t common. Its absence is no surprise. The touchpad is similar to the keyboard. It’s technically large enough, and has integrated mouse buttons like, oh, every other system built today. Responsiveness is adequate, and multi-touch gesture work well. I did have problems with unintended input, however, as the pad’s palm rejection didn’t always succeed. 1,366 x 768 in 2015? While the Radius 14 feels like a budget notebook, its overall build quality is more solid than I’d expected given its price. I started to wonder if Toshiba had pulled off a miracle and introduced a budget 2-in-1 with zero cut corners. Then I started testing the display. 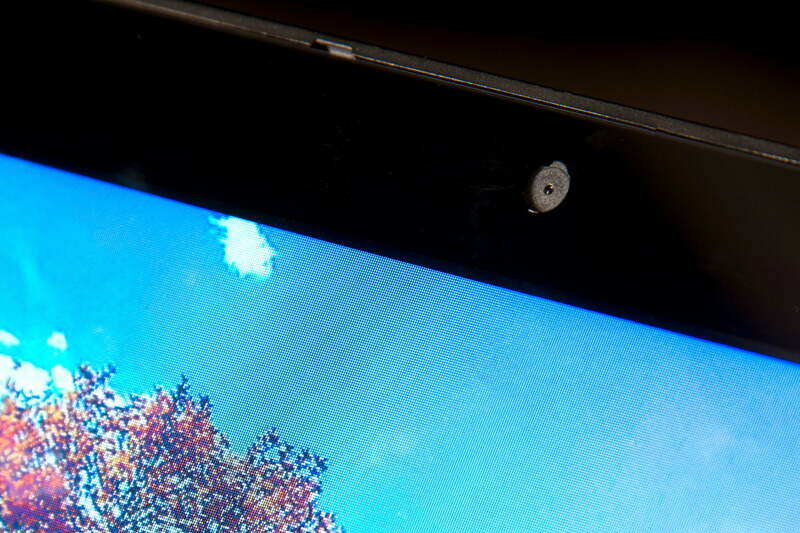 The touchscreen’s resolution is a measly 1,366 x 768, which works out to about 112 pixels per inch. That’s half a Retina MacBook pro, and 60 ppi fewer than a typical 1080p, 13-inch notebook. The result is obvious pixelation that’s most noticeable during tablet use, when the screen may be held just a foot away. Compared to a nicer system like a Surface Pro 3, the Radius 14 seems to be running a retro 8-bit edition of Windows. Resolution isn’t the only area the screen’s quality slides. It’s also saddled with one of the most reflective surfaces I’ve ever seen. It’s almost mirror-like, and the backlight’s maximum brightness of 175 lux isn’t nearly sufficient enough to overcome glare. Outdoor use is just barely possible, and it can be difficult even in a brightly lit room if you’re viewing content with a dark background. The mirror-like display is almost impossible to use outdoors, or even in a brightly lit room. The issues with the display don’t stop there. It also falls short in, well, just about every metric. It only rendered 59 percent of the sRGB gamut, displayed poor black levels, and came to an average color error of 9.49 (lower is better). 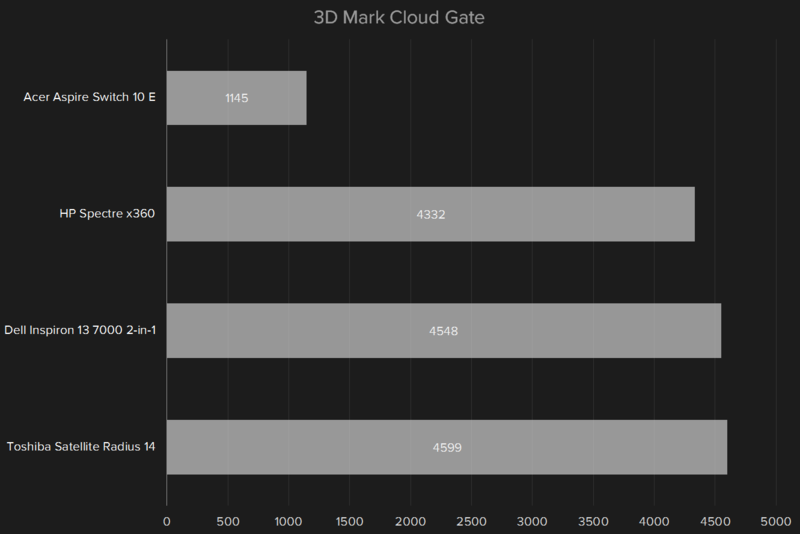 Most mid-range laptops can now hit an sRGB gamut between 90 and 95 percent, so the Radius 14’s won’t win any awards. These flaws are obvious in practical use. Images and video look washed-out due to the lack of contrast and poor color reproduction, and in some scenes significant shadow detail is lost. The Radius 14’s display can only be recommended by the fact it’s not broken; in all other respects it’s sub-par, and inarguably the laptop’s greatest flaw. It can only be excused by the fact that most similarly priced laptops struggle with the same issues, though 1080p can be found in a few models below $600. Our review unit arrived with a Core i3-5015U processor. This is an entry-level chip, and not part of the latest 6th-generation “Skylake” line-up. It’s a dual-core with Hyper-Threading and runs at a maximum clock speed of 2.1GHz. Unlike Core i5 and i7 processors, it lacks the Turbo Boost feature, which can enhance the processor clock speed when thermal limits allow. This has a predictable impact on processor performance. 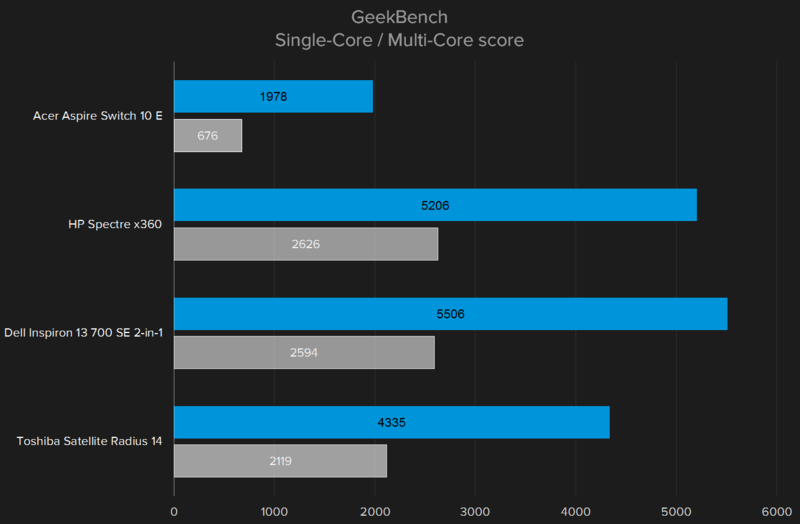 As you can see, the Radius 14 comes in quite far behind the other 2-in-1 laptops we’ve recently tested, offering about 20 percent of their performance in single-core and multi-core tasks. However, the Radius 14 blows the doors off the Acer Aspire Switch 10 E, which we reviewed with an Intel Atom quad-core. Price is still a factor here. At $450, the Radius 14 is more than half the price of the Spectre x360 we tested, and several hundred less than either the Dell or the Lenovo. While the Core i3 gives a good account for itself, there’s another component in the Radius 14 that’s more worrying – the 500GB mechanical drive. It has no hope of competing with a solid state drive, but just how far behind is it? Quite far. The sustained read and write performance of the Radius 14 is about a quarter that of a typical SSD-equipped 2-in-1. Only the Acer Aspire Switch 10 E, which uses a cheaper form of flash memory than is found in most notebooks, is in the same neighborhood. Even this doesn’t tell the entire story. A mechanical solid state drive works by moving a read/write head across a disk platter to retrieve and store data. That pushes access times up to about 20 milliseconds. Doesn’t seem like much, right? But compared to an SSD, which can access data within half a millisecond, the difference is noticeable. The Radius’ mechanical drive also feels more sluggish when multiple programs or files are opened simultaneously. In addition to its modest clock speed, the Core i5-5015U makes do with a modest version of Intel’s HD 5500 graphics. Its maximum Dynamic Frequency is 850MHz, a bit less than a Core i5-5200U, which allows a maximum of 900MHz. What does that mean for gaming? Not much, as it turns out. In fact, the Radius 14 performs better than most mid-range Intel Core notebooks we’ve recently reviewed. This likely has something to do with how thermal headroom relates to the graphics’ maximum frequency. 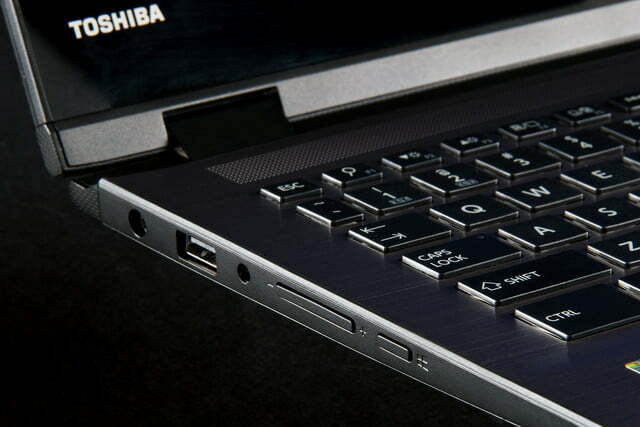 Toshiba’s relatively thick Radius may allow for better airflow. That said, it’s clear this notebook is no gaming powerhouse. It’s arguable the 1,366 x 768 display is a blessing in disguise for gamers, as most games will in fact run at that resolution, though demanding titles are playable only at their lowest settings. 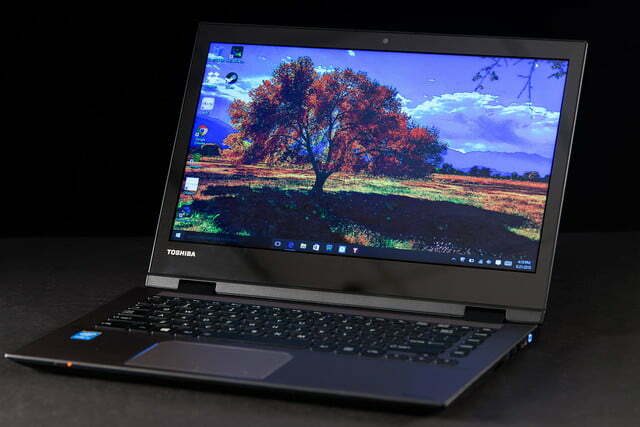 Toshiba ships its 2-in-1 with a mid-range 45 watt-hour battery. That’s a reasonable size, but in our tests it didn’t result in outstanding endurance. We measured four hours and two minutes of endurance in the Peacekeeper benchmark. That was extended to four hours and 38 minutes in our custom web browsing macro, which includes some idle time and YouTube video playback. Four hours of battery life isn’t a great headline, but paying more doesn’t always result in better battery life. Dell’s Inspiron 13 7000 SE lasted just a few minutes longer. The HP Spectre x360 lasted up to seven hours and 15 minutes in our web browsing macro, but as mentioned earlier, it’s at least twice the price. While the Radius 14’s battery life wasn’t impressive, it also doesn’t draw much power. I caught it consuming no more than eight watts at idle, and a maximum of 28 watts at full load. For comparison, the Dell Inspiron 13 7000 SE needs one watt more at idle and at load, and other 2-in-1s we’ve tested consume a few more watts than that. Only the Acer Aspire Switch 10 E is more miserly, as it needed just 7 watts at idle and 12 watts at full load. 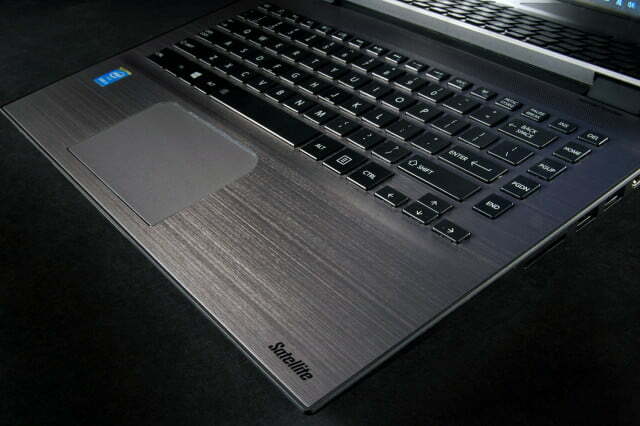 Low power draw, when combined with this notebook’s 14-inch footprint, delivers low heat and great acoustics. The Radius 14 was barely warmer than room temperature at idle, and hit a maximum of 92.9 degrees Fahrenheit at full load. It also generated no more than 37.4 decibels of noise and, in most situations, was close to silent, with the system fan emitting only the slightest purr. Other notebooks in this category run up to 10 degrees hotter and have fans that are up to several decibels louder. 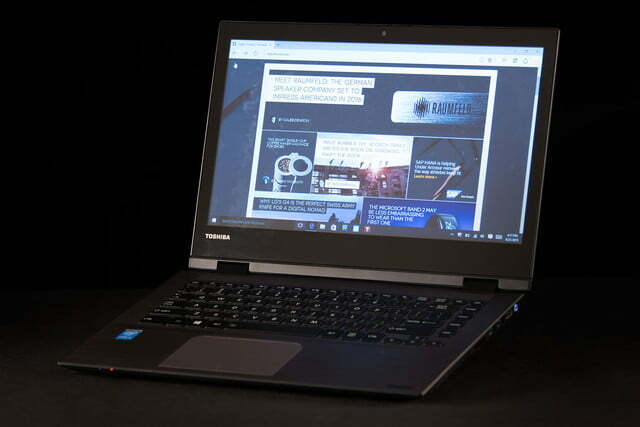 Toshiba ships the Radius 14 with a one-year warranty. This is standard for a notebook, no matter its price. 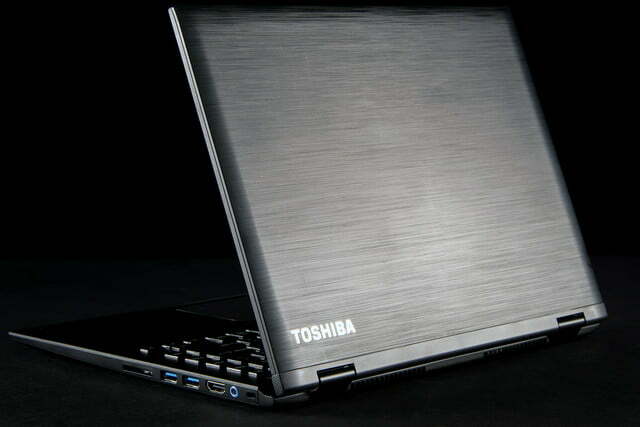 The Toshiba Radius 14 doesn’t have many competitors. While there are 2-in-1 devices sold at or below $500, almost all of them have a 10-inch or 11-inch display, and most use Intel Atom processors (or similar) rather than Intel Core. This affordable 14-inch bag is the budget solution for carrying your budget laptop. Tired of using the Radius’ mediocre touchpad? You can try this inexpensive Logitech portable mouse instead. 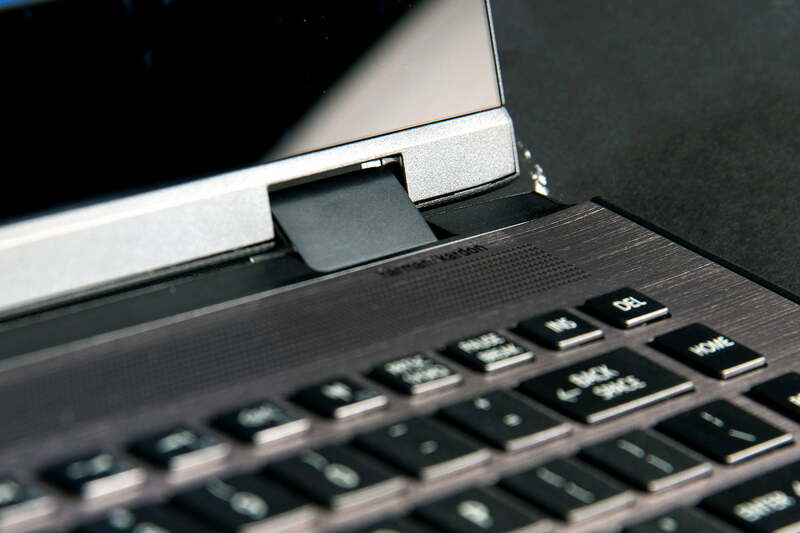 The laptop buddy is essential if you’d like to use your laptop in bed or on your couch. While the Radius 14 doesn’t run particularly hot, this stand can help achieve even better airflow and, more importantly, tilt your display at a more ergonomic angle. Dell’s Inspiron 13 7000 2-in-1 stands out as the nearest alternative. 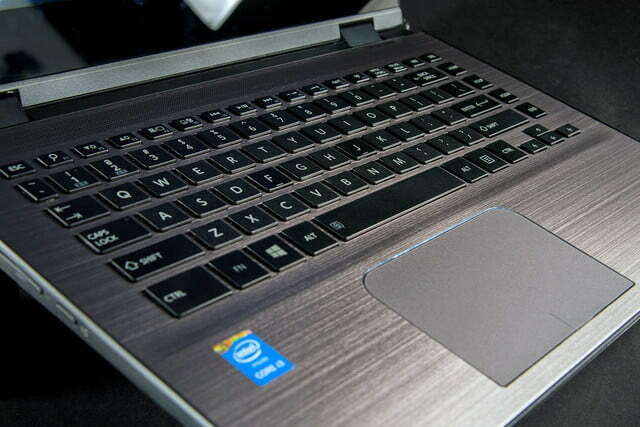 Sold at a base price of $530, the Dell has a slower Pentium processors, and less RAM (4GB vs. the Toshiba’s 6GB). Both have a 1,366 x 768 display and 500GB mechanical hard drive. That’s where the similarities end. 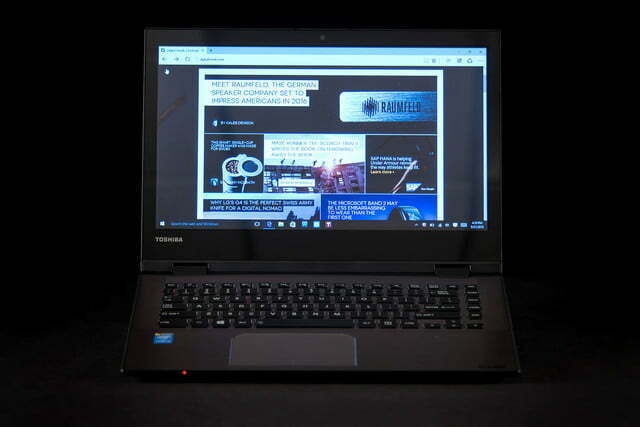 Toshiba’s Radius 14 is more specifically designed for the budget market. Its materials aren’t quite as nice as the Dell, but it does the same job and offers superior hardware at a lower price. The Dell is built to support a range of models that start at $530 can exceed a grand, so it’s more elegant and attractive. 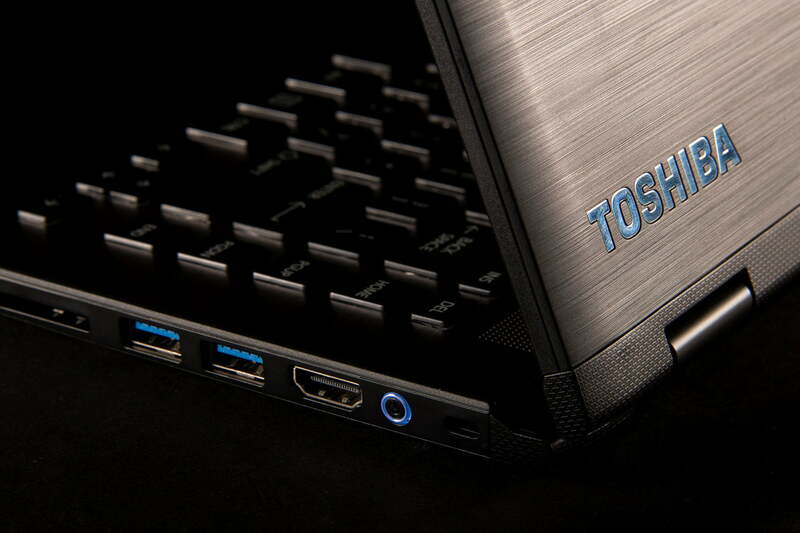 For the price, the Toshiba Radius 14 is hard to beat. It’s clearly superior to most smaller 2-in-1 devices, particularly if you consider tablet mode of secondary importance. Though it’s a convertible, the Radius 14 is really a budget notebook first, and everything else comes second. While the display is disappointing, the system meets expectations elsewhere by being quicker – sometimes substantially so – than its peers. Make no mistake; this can at times be a frustrating notebook. The mechanical hard drive feels sluggish, the high-gloss display is an annoyance, and the battery gives out without putting up much fight. But $500 isn’t much of a budget, and you’ll have to make sacrifices no matter what you buy. 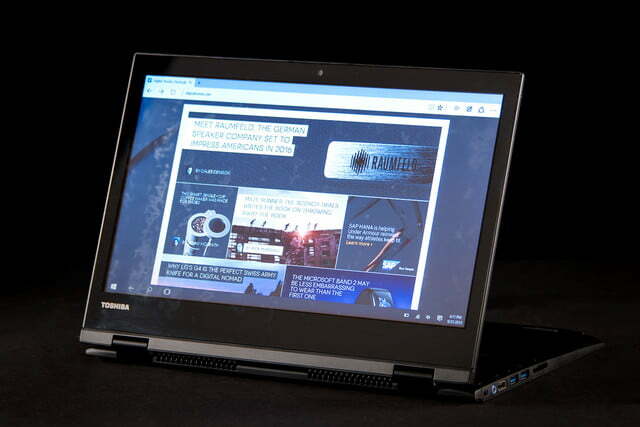 The Toshiba Radius 14 asks for less compromise than other affordable 2-in-1s and, unlike a puny 10-inch notebook, is completely usable as an everyday PC.